In an opinion piece on the limitations of access to crowdfunding projects, we made an argument for taking the initiative to explore sites that promote photographers from countries and cultures less frequently seen. We're following that post with a series of short profiles that will collectively provide a starting point for an exploration of international blogs, online magazines, and pages. We began by looking at Kilele, We Take Pictures Too, Arab Image Foundation, Greater Middle East Photo, Space Cadet, Street Level Japan, Kantor Berita MES 56, Japan Exposures, Invisible Photographer Asia, my new notebook, oitzarisme, and La Fototeca. Today we follow with a look at ZoneZero. In a sentence: Frequently cited as one of the first online photography sites, ZoneZero continues to serve as a multi-media and participatory space focused primarily on contemporary photography and technology in photography. Literally the granddaddy of us all, ZoneZero began as an online site in 1995 - the oldest continually operating photography website in existence and the precursor of today's countlesss photography-related sites. While many sites have been born and closed in the meantime, and today sites with a few years under their belts are considered established, Meyer's ZoneZero remains an active force in online photography almost two decades after its founding. 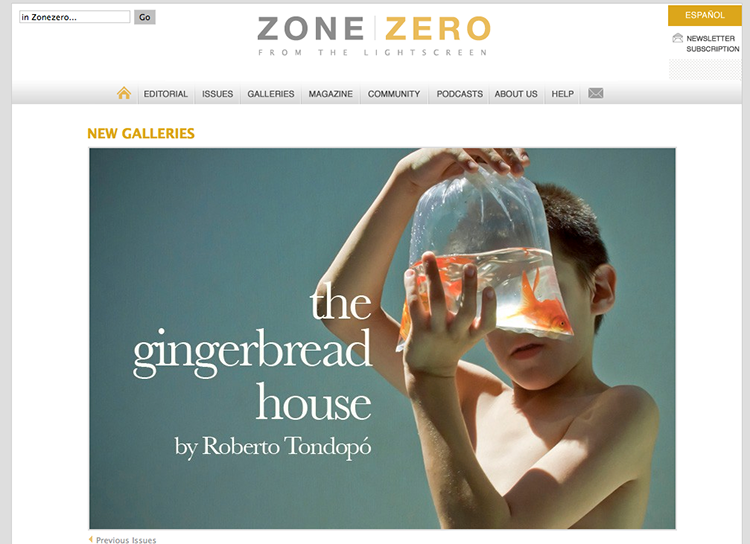 ZoneZero presents contemporary photography and video through its various online formats, listed as tabs below the masthead. Formats include theme-based "Issues," "Galleries" or "Portfolios" of photography projects, video "Podcasts," Meyer's "Editorial" section, and essays periodically added to its open-ended "Magazine." ZoneZero also features a community forum. ZoneZero can be found on Facebook and followed on Twitter.